Please note: The images below are NOT mine; they are from Photobucket. Posted Date: : 07 Dec 2009, 08:15 PM on my MySpace site. Princess Celine stood upon the balcony of her private chambers, watching through silent tears as the sun sent forth its penetrating fingertips - their honed talons determined to shred the remnants of night in order to unleash sun's full glory. Shivering as night's breath hissed with annoyance before darting off to devour another passage of time, Celine hugged her arms to herself, barely managing to retain the sob threatening to erupt from a deep-rooted ache. He had vowed to return by month's end, but seven moons had passed since, and the longer his absence the greater her longing, the deeper her yearning, and the more intense her heartache. She likened his absence to that of a world without the sun... a world without glory, without purpose, without peace... without hope. Oh, how she longed to feel his arms about her once more; to feel his lips upon hers; his coarse hands on her tender flesh. How she adored him. Celine could not imagine any fate worse than being separated from her one and only true love. Lula stepped out onto the balcony, remaining behind Celine as she spoke. Earnest concern laced her tone. "Mistress? It's cold out. Should you not be seated before the fire, if not wrapped in the coverings of your bed...?" With a heavy heart, Celine turned to eye the monstrous bed with all its polished timbers and mass of silk coverings. "There is no place colder than in a bed without love, Lula. The longer I lay there, the emptier my world and arms seem to become." "Oh, Mistress, Prince Koen shall soon return. You shall hold him in your arms before hope's end." "Hope's end is upon me, Lula," Celine declared, gripping balcony's rail. "Mistress, surely this cannot be. Prince Koen has been gone but seven days too long." "Prince Koen," she told the rising sun, "has been absent no less than thirty-five days. The battle has been fought, the war ended, the land has been returned to our kingdom, yet, still he does not come. Men of his leading return, bringing forth no news of his whereabouts," she soberly relayed, her heart tripping over emotion, "but my love does not return. I am weary," she confessed, her head dropping for a moment before she inhaled deeply and returned to her chambers, where she cast off night's attire and stepped into the gown suitable for day's events. As Lula assisted Celine in preparing for the new day, Celine announced, "Today I leave the castle." "But, madam, your orders were to remain safe within the walls of the castle until the day of Prince Koen's return." Celine grunted, willing Lula to tighten the straps of her gown before frustration broke free. "These walls have become my prison. Once my safe haven, once my chamber of love, this fortress is now an icy den of misery. Surely this is a reflection of hell: A world where love no longer resides... I must step free of these walls, Lula, and feel the sun upon my face, the grass beneath my feet, or life and hope may never again fill my soul." Abruptly stepping away from Lula's grip, Celine demanded, "But nothing, Lula. If my prince returns then he shall return to a woman of strength, not brokenness. But these walls," she irately spat, all but cursing her surroundings as she waved her fists about her, "shall see me undone. If my prince returns," she determined, a mixture of dread, loneliness, frustration and determination tumbling forth in the form of thick, but silent, tears, "then he shall find me as he left me... but if not--" she faltered, struggling to silence intense fear as she caught her breath, "then I shall find strength and go in search of him. Either way, these walls will hold me no more." "Enough! Go now! Order James to prepare my horse immediately... I ride out this day...!" With intense emotion surging through vein and nerve-ending, Celine rode hard and fast until every ounce of energy was drained from her downcast soul. In and out of wild terrain she darted, not caring to keep note of her surroundings, or how far the light of day had travelled; seeking to be free of the despair threatening to suffocate her. Wearily, and with horse in slow gallop now, she fell forward, embracing the panting beast with little hope and blinding tears - her lover's name pulsating through her troubled heart like the echo of distant drums. When her mare came to a standstill by the side of a small stream, Celine set it free to quench thirst's desire and found rest beneath the shade of a tree, laying upon her back and staring blindly up through the canopy of gently swaying leaves, to where azure skies watched on in silence. "Lord," she humbly prayed, her breath catching in the back of her throat as an ache rising from deep within screamed with muffled fervency, "I-I need him. What is my life without him...?" A heated tear broke forth, bringing with it a pained sob, scalding her heart on its way. Never before had she felt so alone, afraid or helpless. "If a life must be taken, Lord," she wept, rushing to cover her pained features with trembling hands, "I offer You mine... I beg of You, allow my love to live..."
It was the nudging of her horse's muzzle against the crown of her head that woke Celine from exhaustion's slumber, instantly bringing her attention to the ominous storm clouds hovering high above. Aware night was swiftly approaching, Celine threw herself upon the strong back of her faithful steed but could not recall the way from which she came. Troubled, she turned to and fro, secretly willing nature to point her in the right direction. And that's when she noticed him, a dark figure across the way, sitting tall and proud upon the rigid back of the largest horse she had ever seen. At first, she dared to hope it was her true love, come to take her home, but with the dark silhouette came an icy chill, and Celine immediately sensed something was amiss. As did her horse, it seemed. As the dark figures drew nearer, sauntering upon slow and confident stride, Celine dared to call, "I bid you, good sir, to show me the way to Prince Koen's castle. I will pay handsomely for your time and hand." The approaching stallion abruptly shot forth a gust of air from its nostrils, causing Starlit to shiver and take several steps backwards. Unnerved by Starlit's reaction, Celine held her breath, visually seeking another exit. However, before she could, the stranger rose his gloved hand in courteous gesture and Celine dared to consider him friend, rather than foe; inwardly declaring Starlit was troubled by little more than the immense force the other beast obviously possessed. "Please, sir, I beseech you... help me find my way. I will pay you gold in return for your kindness." "Follow me," came the rumbling of his deep voice. "But gold is not my price..."
Celine woke from her dazed state, pressing hard fingertips against pained temples. She blinked against the darkness surrounding her, unable to see anything beyond the tip of her nose. She closed her eyes once more, trying to recall how she came to be in such a place, but no memory came to her rescue. The coldness felt so familiar, but why...? On registering Enemy had found her alone in the depths of a dark forest, she had aimed to escape, but a whip of lightening had shot forth out of nowhere and sent both Celine and Starlit crashing to the earth; the shock to her head, as it smashed against a hard object, momentarily stunning her. Dizzy, she had pushed herself to her feet, only to stumble and fall into the arms of the dark stranger and his icy touch. She had struggled briefly against his strength, but to no avail. That was when he held her close, crushing her small frame against his massive, armoured chest, forcing the breath from her lungs. And now, here she sat, hidden away from the world, not knowing her fete, with nothing but regret to hold her. It was Lula's love for Princess Celine that sent her rushing to a neighbouring kingdom, pleading with Celine's estranged father to send forth his mightiest warriors to find her. She fell at his feet, begging. He bid her to rise and tell her tale. She knew she took her life into her own hands to do so, but she was convinced he was her last hope. She feared his wrath, well aware that King Maynard had disowned his daughter the day she had married a man not of his choosing, but the tears in the old man's eyes spoke of deep love and regret, not anger and hatred. "My lord, she has been gone two evenings and I fear she has been lost to the wilderness. Prince Koen has--"
"Prince Koen is here, child." Leaping over protocol, Lula cast her stunned gaze at the burly man. "It cannot be so?!" 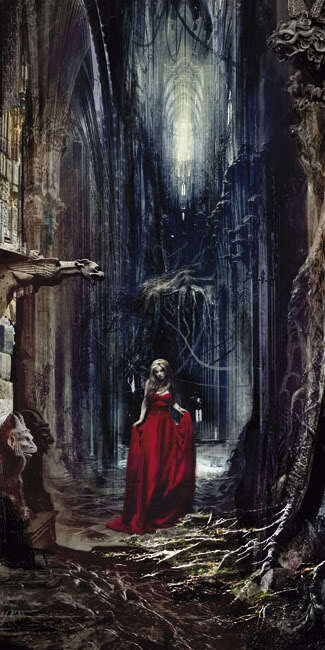 With the wave of his hand, he ordered a servant to "release Prince Koen from the dungeon and have him brought to me." Lula stared in pained disbelief. "No... tell me it isn't so. Your daughter searches for her beloved and all this time he is trapped here? He is your prisoner? Do you not realise in doing this you have kept your own flesh and blood a prisoner, also?!" King Maynard hid his shame behind a trembling hand as he lifted his rotund body from his throne and stepped away. "I have been a fool." "I thought his absence would help her come to her senses. Celine is my only child, the heir to the throne and once promised to another - a king of great stature. But she denies my will for the sake of her heart." "And you deny her heart for the sake of what? Power? Your vanity?" With a grunt he spun about, but in her shock Lula failed to flinch. A surge of love unleashed hidden courage and she dared to rise against the cruel hand offered to the woman that had cared for her like no other. "I did it for my kingdom!" he declared. "There is no room for childish notions in the world of a king, nor in that of a princess. There are duties to be performed!" Though her voice was soft, her emotion was thick and the conviction she spoke with powerful. "You are wrong, sir." She stepped a little closer, tears stinging her glaring eyes as her lips thinned with disgust; deep grief twisting her heart as she registed the suffering this man had brought to Princess Celine. "There is no greater duty of a father than to love and nurture a child he has helped give life to." With trembling voice, she clenched her teeth and irately choked out, "A king you may be, sir, but a man you are not!" When Prince Koen called to her, Lula failed to remember her place and rushed to embrace him; the wounds in his right hip and shoulder suffering at the touch of her enthusiasm. In agony, he groaned, and Lula immediately fell at his feet, shocked by her own behaviour. Being released from the king's guards, Koen stumbled to his knees, gasping for breath as pain shot through nearly every inch of his being. Weeping, Lula looked up into his darkened eyes. "Oh, my lord... the king has beaten you?" Koen shot King Maynard a brief glance, sending dark emotion with it. "No... my wounds are from the battle. The -- king," he bawked over the other man's title, "found me near death. My wounds have been slow in healing through lack of fine food and fresh water, but torture me, he has not. Lula, speak to me. Tell me of Princess Celine. How be my love...?" When the story was told, Koen stared in stunned silence. "I will send my men to look for her," Maynard announced, choking back tears. Koen rose as tall as he possibly could, the wounds of his flesh falling silent before the cry of his troubled heart. Looking directly in King Maynard's eye, he ordered, "You will bring forth my horse and weapons, and in doing so you shall save your own life. But if you near my bride again, I shall not be so generous." With a vengeance, he rode forth, determined to fight the demons of hell if necessary. No power or principality would keep him from rescuing his beloved. There was no power stronger than love, and love would be his conquering force. Of this, he was certain. Come hell or high water, he would hold Princess Celine in his arms once more...! It was the memory of Koen's knowing touch that came to hold Celine through dark's eerie silence, offering comfort and peace as she recalled her beloved's warmth and tenderness: The way he often held her in his arms, playfully keeping his lips from hers as their souls entwined through the intimate glimmer in their eyes and the intense beating of their hearts; as she strongly yearned to be brought to completion with her one and only true love. The way he teased her with silent promises of fulfillment, tracing a fine line of warm kisses from a bare shoulder, along the side of her highly sensitive neck, nipping her flesh here and there before moving along her jawline, stealing her breath and replacing it with intense anticipation. She recalled how he often swept her up into his strong arms and carried her to a place of privacy - her favourite place being on moist lawn, beneath gentle moonlight, where nothing came between them other than the heat of their passion and the whispers of forever love. Remembering, she lay in the dark, allowing a single tear to escape as she whispered her prince's name into the silence of the night, imagining him holding her close, longing for his touch, aching for his presence, needing him more than her next breath... but it wasn't simply the act of making love she reminisced over, but the profound, intimate love they shared; the way their hearts bonded with purity, faithfulness and vows of forever. She loved him. With all that she was, she adored him, and he adored her, as well. She was certain of it. The respect he gave, the intimacy, the way he stopped the world just to heed her words at time, the way he favoured her before others... it all worked to reveal the depth of his beautiful heart and the love he possessed for her. It was this love, this bond, that spoke to her now, convincing her that Koen still lived and would find her; that enabled her to hold onto hope. Yes, eventually, he would find her, and he would hold her again, kiss her again, love her again, and she would serve him with her love, in every area of their lives, more intimately than ever before. This was her vow. This was her need. It was not a tender hand that came to drag her out of illusion's security and into a brilliant light that momentarily blinded her; the merciless grip tossing her to her knees. Horrified, Celine gasped, the bright lights piercing her eyes with intense pain. She rushed to cover her eyes as instinct pushed her backwards, away from the monstrous figure before her. "You will wash and dress and tonight you will be mine." With heart breath thickening in the depths of her throat, Celine ground out, "No." "You were promised to me, and your vow you will fulfill." "But I am already the bride of Prince Koen." "Koen is not recognised in my kingdom, Celine. Your father promised me your hand in wedlock, and wed we will. My kingdom needs an heir and you will produce for me a son, or death will await you." No, she inwardly cried! She would never give herself to any man but one. "Death would be far more favourable than sharing your bed!" Because her eyes were yet to adjust to the light, she could not tell what expression the dark figure held, but she heard the sniggering in his deep voice. "Death will come soon enough, princess, but to your prince and not yourself. Either bear me a son, or watch your prince suffer a violent death." Vehemently, she cursed him, but he simply laughed and walked away; his threat aggressively echoing through Celine's tortured soul. With King Maynard's confession aired, Koen rode directly to Siyamak's castle, anger and determination thickening in the depths of his soul, driving him on. This time the Baron had gone too far! This time Koen would show no mercy against the being no man dared to venture near. Siyamak was known as a heartless soul, seeking to destroy all that got in his way. However, until now, he had kept clear of Koen's province, now only coming to seek that which he had been promised ~ the woman he now believed to be his personal property. It was the dancing light of a window that caught his attention, the shapely figure moving within the bright glow gripping hold of his heart with a powerful mixture of relief and dread. His love lived... but at what expense to her soul...? "Celine..." His voice was but a whisper, thickly clawing its way through the trepidation threatening to still his heart. Forced to don a gown that made her feel as though she were being prepared for entombment rather than matrimony, Celine nervously paced the room that now kept her prisoner, dreading the sight of the bed standing tall in the centre of the room, draped with raven-black linen and dirty grey lace. Her heart pounded with dread, her breath remained locked behind her constricted torso, and a tear burned its way to freedom. God... what had she done?! If only she had heeded Koen's warning, then she would not have walked straight into Siyamak's trap. And now her reason for living would be her reason for selling her soul. As nausea threatened to consume her, a sudden gust of wind swept in through the open window, and upon it came the whisper of Koen's voice. As hope gripped her heart, Celine caught her breath, daring to believe that her love had come to rescue her. But as swiftly as joy embraced her, dread came to invade her soul. Although she longed to be in Koen's arms again, she knew to be so would be to see him face his death, and that she could not allow. He had to stay away from her. He must. But loud was the cry of love, and try as she might to deny her heart, it echoed his name with every beat, calling out with deep longing. Daring to step out onto the balcony, Celine set her prayers upon a silent breath, willing Koen to end his search, but she knew, even as she prayed, that he would not give up until he held her. It was then that he heard his cry, her vision instantly falling to a dark figure, far below, climbing locked gates. "Koen..." she gasped. "No! Oh, God, no..."
Laughter ~ loud and heartless ~ broke the silence, startling Celine, stilling Koen. An arm of heavy armour abruptly snaked itself about Celine's waist and snapped her trembling body back against Siyamak's broad chest, crushing the air from her lungs and filling her soul with fear. Koen cried out in alarm. "Celine!" Amused, Siyamak ensured Koen watched as he gripped hold of Celine's chin with clawed fingers and forced her lips to his own. She squirmed and squealed and struggled to break free, but the more she faught him, the more inflamed his kiss became. "And now," he hissed, "the games begin..."
Anger raged through Koen's spirit, pushing him to face his enemy no matter what the cost. "Siyamak!!!" he shouted as the fiend pressed his lips to Celine's. Koen's cry a threat. "You will let her go!" Siyamak laughed in the face of his future bride, watching as she fainted in his arms. To the man below, Siyamak shook his head, amused and far from troubled. Swooping Celine up into his arms, he spoke a language unknown to man, bewitching her soul. One way or another, she would be his, and, for now, she would fight him no more. As Siyamak lay Celine upon his bed, he called for a servant. "I've tolerated that fool long enough. Have him caught and tossed into the dungeon. We'll play again tomorrow. For now," he declared, aiming to remove his armour, "my bride awaits..."
...Finding himself locked in a dungeon, Koen called out demand after demand, but his voice fell on mute soil. As he grew weary, a cough echoed out from the darkness. Startled, Koen ordered, "Who goes there? Friend or foe?!" "Does it matter?" came the reply; the voice aged and lighthearted. "The only weapon I possess is wit, and that's not as sharp as it once was." On hearing the sniggering, Koen leaned back against the wall and closed his eyes, the only sense useful to him at present being his hearing. Morning would come soon, then perhaps he would be able to study the room in which he was imprisoned, but until then there was nothing to do but will the hours away. "So, son, you're just going to give up?" "Wouldn't have many friends then, I take it." "Friends? I don't understand your question, sir." "You sound stubborn, which often means you wouldn't even risk losing an argument, let alone anything else." To the dark, and with slight annoyance, Koen confessed, "I would only argue if I believed I was right." "Never been proven wrong, ay? Must feel good to be so certain of everything..."
"Sir, what is it you are trying to say? I can't see your expression but your tone infers you are trying to prove a point." "No point. Just making conversation." Frustrated, Koen released a thick breath. "Tell me there is some way out of this place!" "And risk an argument?" the aged voiced laughed. "Not this night, my friend." Annoyance rattled Koen's soul. "Who are you?" "One who will never pass this way again. I am always watching over you," he said, "but this is the only time I am permitted to speak to you..."
Confused, Koen stood tall and took a step in the direction from which the voice echoed. "What foolishness is this you speak?" "Do not be frightened of the other side. It is beautiful on the other side." "Other side...? Death? You speak of death? I do not fear death." "I know that you are brave and strong, Koen. I know that your will is as powerful as your love, but there are areas within your heart that you must pass through before you can be truly free; before you can truly set others free. Death is a relentless force, yet greater destruction has been birthed upon the earth through the pride of man." "Sir! Explain yourself! Your words bring me nothing but irritation!" It was then the man stepped forward, a faint glow outlining his frame. What Koen initially believed to be a small, fragile old man, revealed himself to be an angel of epic proportions. Koen gasped, having to tilt his head high to eye the being towering over him. "I am not as important as your unborn child." "My---? Celine...?" Koen's heart trembled, and his gut twisted with both joy and dread. "My love is with child?" "In two seasons from this day, a daughter is to be born to you... but the life of this child depends on the sacrifices you are willing to make." "For my child," he vowed, "I would sacrifice anything." "Even the life of your true love?" "Celine...?" Dumbfounded, Koen turned away, pressing his open palms to his closed eyes. "This is a dream... a terrible dream." "Time is short, Koen... Siyamak has sold his soul to Lucifer, and tonight Lucifer seeks to destroy the child sent to reign in your place. Your daughter has been chosen to be a grand vessel for our God... a prophetess who will guide the people of your land. She has been gifted with great insight and a heart that will open the closed minds and doors of many. Lucifer has learned of this and seeks to destroy the child, chosen to be born to Celine, and in her place he seeks to bring forth another. A false prophetess who will bring man to their knees and the earth to great destruction. A heart of great pride." As he asked, a prison door clicked open, and the angel informed, "Though death may appear to be the end of hope, it can never break the bonds of love. You will know what to do when the moment is before you. But the answer may not be one you expect, Koen. And only you hold it." Dazed and nauseated, Celine welcomed slumber's hypnotic chant, her thoughts not quite her own as she drifted from one obscure imagining to another. Something beyond her reach called out to her, but she steered away from it, not recognising its voice; not trusting it. As her own breath set her adrift on the threshold of reality, opening a porthole to dream's impulses, she took hold of peace as though it were a solid object, and held it firmly in the pit of her soul, examining it as the desire to find an answer to a question yet to be formed in her mind aroused curiosity. Like a stranger in the night, peace stood before her, offering little more than the scent of uncertainty. She willed it to speak, but, as she did, it took on the appearance of a savage dog, swiftly turning on her as though she were its next meal. She did not fear it ~ did not flinch before it, and as it leapt towards her it transformed into a screaming crow and flew away, leaving behind it a trail of orange smoke. A hint of sulphur brought Celine dis-ease. Troubled now, she remained secured by the bonds of sleep and watched as the most dazzling rainbow she had ever seen shattered into a thousand pieces before being consumed by pitch darkness. Through the darkness came a large figure, its menacing face revealing two hypnotic eyes of fire. Celine felt she should be afraid of it, but his touch to her neck only seemed to bring comfort. The cry of her name echoed through the corridors of her mind, taking on the form of a kite without a string; she wanted to chase after it, but weariness overcame her. When the hand was removed from her neck, she suddenly felt cold and alone and stirred upon the bed, willing the world around her to make sense... but reality was not on her side. Koen burst into the room with fury, instantly aiming for the large figure standing by the bed upon which Celine lay. With little thought for his own welfare, Koen threw himself and the blade he had found in the halls of Siyamak's castle at Siyamak, but his enemy was quick and he swept Celine up into his arms, then, without delay, leapt from the window. Without hesitation, Koen followed after them, dropping to the earth before Siyamak's wild stallion. Startled, the horse threw himself up on his back legs and both Siyamak and Celine fell to the earth. Celine remained unconscious. Siyamak was momentarily dazed, giving Koen the opportunity to attack. But strong was his enemy, and small was his weapon. With the back of his massive fist, Siyamak sent Koen flying through the air. When he rose to fight again, Siyamak had already taken hold of Celine, standing her before him as though she were a shield. To her throat, he held a dagger. Koen stepped back, determined to see Celine safe no matter what, but in the next wild heartbeat he recalled what the angel had declared, and realised Celine was of no use to Siyamak dead. Convinced Siyamak would not harm Celine, Koen stepped forward, preparing for battle. Siyamak hissed. "You would see her die?" Koen did not respond to Siyamak's idle threat. It was the woman his enemy needed. He would not harm her. To do so would see his plans fail. But when Siyamak aimed the blade as Celine's stomach, Koen froze, well aware that the child within her womb - his child; their child - meant nothing to Siyamak. Stray recollections of the angel's conversation washed before Koen, bringing slight confusion but no answers. With his heart pounding in his head, and dread threatening to bind his sense of reason, he closed his eyes and dug deep for a possible solution for the scenario being played out before him... but nothing came. Sacrifice Celine...? His child...? Sacrfice the life of the two most important people in his world, to save a town from the destruction of a false prophetess...? Is that what the angel asked of him...? No! He couldn't possibly tolerate the loss of Celine, nor that of his child. No. That couldn't be the answer. Desperate for wisdom, Koen flicked back over the angel's proclomation, time moving slow as his heart raced forward. To himself, he echoed, "Death can't break the bonds of love... A prophetess to lead or to destroy...? Save the life of two or many...? I don't know! Oh, God... I just don't know..."
"Greater love..." Celine softly breathed, her eyes fluttering open only to shut again. "Greater love..." Koen echoed, struggling to understand. He pressed deeper into his soul, seeking answers, praying for guidance. His heart raced at a frantic pace, and his flesh ached for action, but he willed himself to be still, and that's when he heard, "Greater love has no man than he who lays down his life for a friend..."
It was in the depths of this truth Koen realised, "There will be no sacrifices, Siyamak. The lives of men have already been paid for. By the blood of the Christ, the one who controls you has been defeated. You do not hold the keys to life and death. Lucifer does not hold he keys to life and death. But if it takes my life to save that of this child, then so be it!" His words fell on deaf ears, and Siyamak pressed the blade closer to Celine's stomach. Koen tensed with fear. Playing all possible outcomes through his mind, Koen feared for the welfare of his bride and child. One thought after another only proved to bring greater confusion and worry, until he could take no more. From deep within the solution came, and with it came the peace that went beyond all understanding. He lifted his head to the heavens and declared, "Father, with you all things are possible... and into your hands I commit the lives of your daughters, knowing you love them far more than I ever could. And into your hands, I commit my spirit. Let your will be done, not mine." With faith leading the way, Koen trusted his bride and child to the capable hands of God, and threw his own life at Siyamak. Air, thick and cold, gushed into Celine's nose and mouth, causing horrific pain as it forced its way into her lungs. She gasped, her back automatically arching when her torso felt as though it were being ripped in two; as soul and flesh reconnected - her mind once more becoming her own. She blinked and reality snapped into being, relentlessly challenging her with its harsh facts. As trepidation violently surged through every inch of her, Celine forced her weary body to its feet and hurried to the edge of the cliff, shouting into the darkness below; land's edge crumbling into a thousand pieces beneath the point of her shoes, plummetting into oblivion, threatening to take her with it. On the thought of what became of Koen struck her, desolation gripped her tightly and an agonising wail of bereavement carved its way up from the depths of her spirit, causing her entire being to shudder; forcing her to her knees as she prayed for her beloved to call back. "Oh, God," she prayed, as the world about her started to spin. She lightly pressed trembling hands to where new life was growing inside her womb. "You can't take him from us." She closed her eyes, begging for mercy, shaking her head, trying to deny the reality that pierced her heart. Her lower lip trembled as she begged, "Please..."
Staring into the darkness, not blinking, not swallowing, unable to think straight and longing to never breathe again, she inwardly cried out his name once more. She snapped her eyes closed as heated tears fell, the memory of his touch rushing to squeeze life's breath from her contracting lungs. "I need you," she whispered into the night, the dense silence crushing her spirit. "I need you. Please, my love," she softly choked out, willing his heart to hear her cry. "I need you..."
King Maynard stood by the foot of his daughter's bed, regret cutting him deeply. Even in her sleep she wept, mumbling Koen's name, pleading for him to return. His men had searched high and low for Koen's body, but none was found. Nothing, it seemed, remained of the man she adored... other than his child. Wiping a tear from his cheek, Maynard begged God for forgiveness. It was all his fault. He knew it was. If he had not held Koen prisoner, Celine would never have travelled so far from their home, and they would be in one another's arms now. And he had done that solely out of the selfishness of his heart, seeking to build up the power and wealth of his own kingdom. Guilt charged its way through his soul, bringing with it great nausea. A guttural groan broke free from the aging man's throat and as he aimed to leave the room, Celine called to him. He stopped, not daring to look back at his broken child, his heart shattering with the weight of her silent tears. "Father, he... he loved me." She inhaled deeply, releasing the breath with a mournful groan; her voice a mere whisper. "He may not have been everything you desired, but Koen was a good man..." Her lips trembled and she caught her breath, a weak, but hard fist pressed to her stomach. "He was a faithful man... and..." she forced out through the depth of misery that shot through her father's heart like a two-edged sword, "he loved me..."
Crying into an open hand, Maynard nodded. She needed to convince him no more. No words could break him more than what he already had been this night. "I'm sorry..."
With a strength and a determination Maynard would've once declared a woman should never posses, especially in the sight of such devastation, Celine forced her upper body up off the bed, pain scratching her brow, as she leaned forward to drive home her point. "I need you to hear me, father, as you have never heard me before... I cannot live as you desire me to. I have a purpose, beyond your understanding. I know it. I feel it in my heart. Passion demands I follow it..." Whether her mood was now tainted with anger or driven by earnest conviction he was not sure as she all barely managed to mouth the words, "You have to let me go..."
Still unable to bring himself to look into the eyes of his precious child, Maynard nodded his head ~ his tears hot and thick. Clenching her stomach, as though physical pain called for her to do so, Celine dropped back on the bed, arching back slightly as she closed her eyes over a fresh bout of tears and as she caught a steadying breath. Once she settled back into the mattress, she declared, "I...I will rise again, Father, for the sake of my child... and so I can bring great honour the name of my beloved. I..." she faltered, struggling to hold back tears; "I will live to honour his name...all the days of my life. He may be gone," she groaned, sucking in a deep breath before finding the strength to go on, "but his love still completes me. His love still remains... and it is his throne I will live for, no matter what the cost. His and his alone..."
Over his shoulder, Maynard mumbled his deep regret. "I'm so sorry. My child, I am so very sorry..."
"Father, wait!" she called, forcing her legs over the edge of the bed. She held her arms out to him and he instantly ran to hold her to himself; their tears at one; her mercy bringing him undone. How Celine could find it in her heart to forgive him he did not know, but oh, how grateful he was for the heart and passion she dared to possess. "My child, if I could sell my soul to bring Koen back, I would. My darling, I would..."
Hiccupping through her tears, Celine found herself looking up into her father's tear-filled eyes, his regret weighing heavily upon her soul. She pouted, as she did in times long gone, when this man had loved her without agenda. She touched his tear-stained cheek and shook her head. "No, papa," she tightly breathed, emotion setting thickly in the back her throat. "I-I can't lose you, too. Not you, too." "Siyamak sold his soul," a voice from beyond the glow of a candle conveyed, "and look what suffering that brought to so many... not to mention the cost of his own life. There will be no more deals with the devil. Let God's will be done...and then the world shall know a love far greater than all others..."
Stepping out of the darkness, and into the light, he came... bloodied and bruised and looking broken. When their eyes met, Koen began to weep, dropping to his knees in sweet relief. Without thought or breath, Celine called his name and raced to his side, dropping to the floor before him, cradling him to her breast; their tears soon forming one solid flow as hope was restored to them; their passionate kiss weakening only long enough to take in a much-needed breath, as love came to unshackle, and reconcile their souls. As Prince and Princess again, to love and live forever."